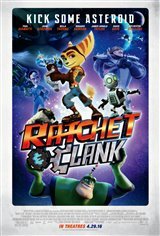 Ratchet (James Arnold Taylor) is a spunky Lombax who yearns to leave behind his dull life as a mechanic. He dreams of becoming a Galactic Ranger, just like his hero Captain Qwark. Along the way, he befriends a robot named Clank (David Kaye), and they stumble across a dangerous weapon able to destroy planets. The two unlikely heroes must then join forces with a team of colorful heroes called the Galactic Rangers, in order to attempt to stop an evil alien named Chairman Drek from destroying every planet in the Solana Galaxy — before it's too late.